Boo! Solitaire Halloween is here to get you! Spooky great fun, all wrapped up into one awesome solitaire game. 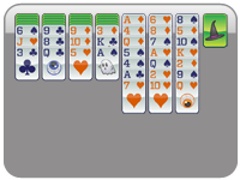 This chilling puzzle game solitaire includes spook-tacular cards, a web-tastic background, and nine extraordinary Halloween themed solitaire games: 1 card klondike solitaire, 3 card klondike solitaire, freecell, 1, 2 & 4 suit spider solitaires, yukon solitaire, wasp solitaire, and scorpion solitaire! 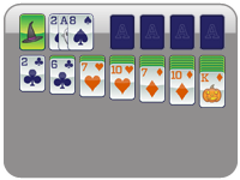 Ready to try this first fun card game solitaire? Solitaire Halloween features this spooky version of One Card Solitaire Halloween Klondike! This easiest solitaire game will keep you coming back for more enjoyment day after day. Turn cards over one at a time in the waste deck to add cards to the game. Build tableaus downward by alternating color. Oops? Run out of cards? Click on the X and go through the waste deck again. 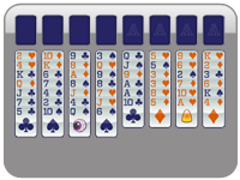 The object of this one card solitaire game is to move all the cards on the board into the upper four slots according to suit, building up from Ace to King. Get all the goblins and gremlins into the suits and you'll be declared winner! 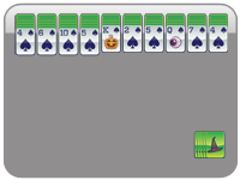 Whether it's the days leading up to Halloween, or as you wait for the scary or funny trick-or-treaters, enjoy a fun hand or two of Solitaire Halloween! Let this be our special treat for you! 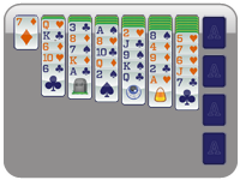 After all, Solitaire is one of the top ten all time favorite card games! 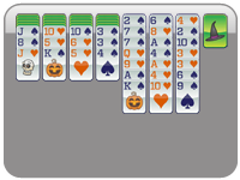 Happy Halloween from Solitaire Halloween.com! Enjoy this great game, and be sure to try all the other fantastic games provided by Solitaire Halloween! Stack cards in tableau, alternating colors in descending order. Place a King into any empty column. Go through the waste deck as many times as you need. Usually it's best to focus on moving cards from the tableau to the suit piles, rather than being concerned about getting through the waste deck.